The slump in the upper tiers of the Manhattan real-estate market is already having a knock-on impact in some of the toniest tri-state area real-estate markets - most notably that of Greenwich, Conn., known for being a leafy suburban haven for hedge fund titans and other MOTUs. 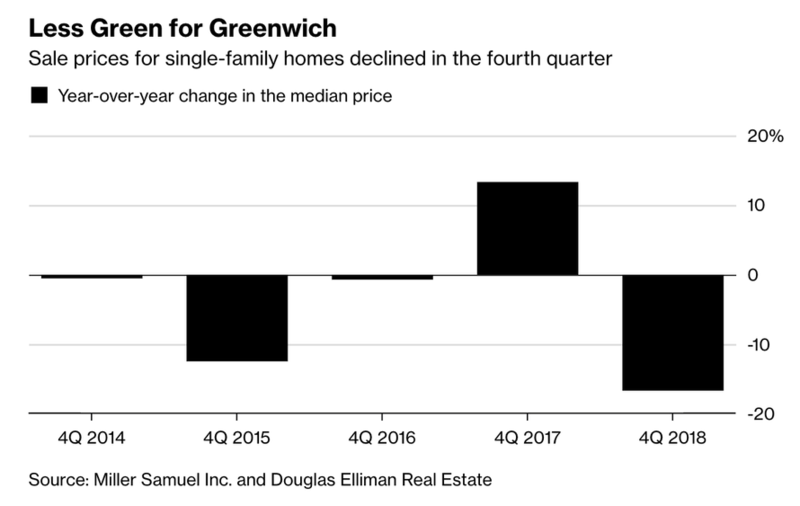 To be sure, sales of luxury homes in Greenwich have been falling for a while now, prompting many sellers to pull their homes from the market in the hopes that conditions might improve. But in a sign that wealthy New Yorkers looking to trade their two-bedroom UES apartments for a sprawling Fairfield County estate are being forced to scale back their budgets after their apartments didn't fetch as high a price as they had hoped, Bloomberg reported that the median home-sale price in Greenwich fell 17% during the last three months of 2018 to $1.5 million. Overall purchases continued to slip, falling 2.2% during the quarter. Real estate brokers told BBG that the weakness in the NYC market was largely to blame. "The weakness in New York City has definitely played a role in some of the weakness that we’ve felt here," said David Haffenreffer, brokerage manager of Houlihan Lawrence’s Greenwich office. Sellers who got less than they wanted for their city apartments "are in turn then dialing down their budgets when they get here to look at homes. Or, it’s just flat-out delaying their ability to buy here." And just as New York led Greenwich on the way down, sellers in Greenwich will be looking to New York City to determine when the market equilibrium has shifted back into the seller's favor. "As New York City finds its footing, so too will our markets," Haffenreffer said. "We’re just waiting for those indications." And sellers in the high-end of the market have already largely pulled their inventory off the market, as weakness first surfaced in the market for homes selling for $10 million or more (a trend that some brokers blamed on a shift in tastes away from estates and toward more centrally located homes closer to down town and public transit like the train station). In a town known for its $10 million-plus estates, most purchases in all of 2018 were for less than $2 million, according to a report by Houlihan Lawrence. There were 335 single-family deals in that price tier, up 4 percent from 2017. Condos continued to be an appealing option for buyers looking to keep city-style living and amenities even after moving to the tony suburb. Purchases jumped 23 percent in the fourth quarter from a year earlier to 48 deals, Miller Samuel and Douglas Elliman said. The median price was $746,250, down 3.1 percent. Lately, weakness that was initially confined to hot urban markets has been seeping into the broader US housing market, as data showed sales slumped by double-digits during Q4, one of the worst quarterly showings since the housing recovery began.